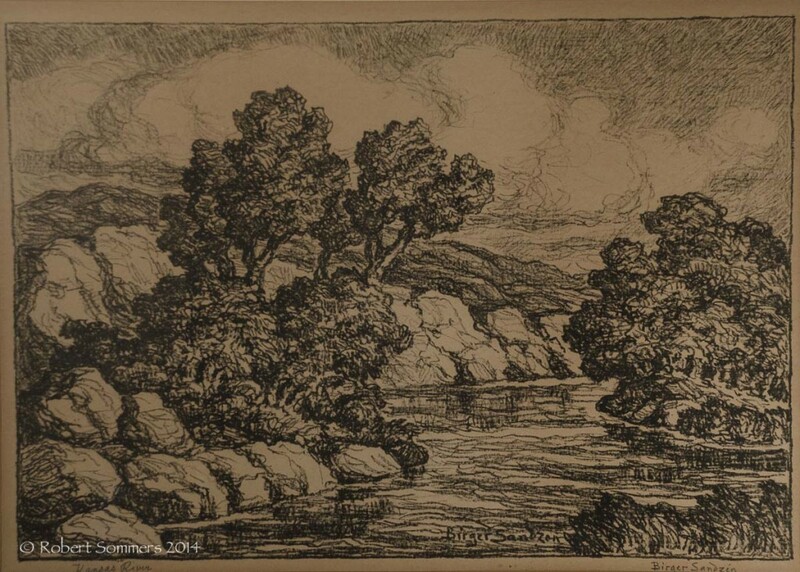 Birger Sandzén ( 1871-1954) Kansas River lithograph, 1951 signed lower right, titles lower left 10 x 14.25″ p.o.r. Born in Bildsberg, Sweden, Sven Sandzen had a long distinguished career as an art professor at Bethany College in Lindsborg, Kansas and as an impressionist landscape painter. His work evolved from Pointillism to a very personal style of bold color and with masses of paint, akin to that of Vincent Van Gogh and Fauve painters Paul Cezanne and Henri Matisse. He was the son of a Lutheran minister and received his art education in Europe, graduating in 1890 from the College of Skara in Sweden and then taking further study at the University of Lund. He was the pupil of Anders Zorn and studied painting at the Artists’ League of Stockholm and then with Aman-Jean in Paris.